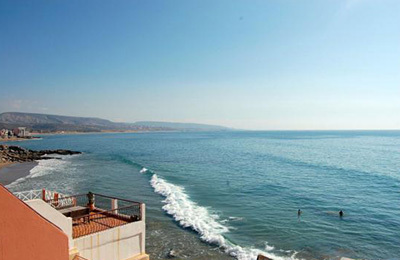 Panoramic Ocean Views Surf Camp Surf - Taghazout, Souss-Massa Guests overall rating: ☆☆☆☆☆ 0 based on 0 reviews. What’s not to like? 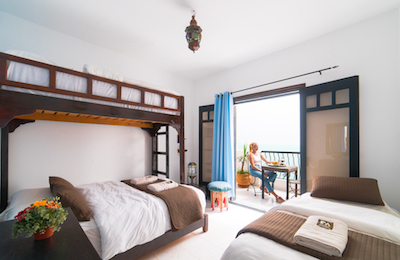 Year ’round sun, world class waves, a local chef whipping up your every meal, sunrises over the Sahara and sunsets over the Atlantic, panoramic ocean views from our ocean front balcony, after surf beers and wacky tobacco in your shisha pipe. And that’s just the half of what Morocco Surf Camp has to offer! Our package is for everyone, from the seasoned surfer to those who simply want to wet their toes and sun their bellies. Our instructors specialize in teaching absolute beginners how to find their feet, and in taking those who want to step it up a bit to the multitude of world class waves dotted around this peninsula (you can see three of them from our hostel). Come any day you want and stay for a minimum of 6 nights, chasing waves and soaking up the culture. Escape European winter with us, we got your surfing covered any time of year! Age: Young at heart travelers, 18+. A note on the balcony, because it deserves it. This balcony is amazing and is definitely the focal point of the house. This is where we eat, drink tea, share stories, chug beers and smoke hookah. This is the place where you can play a game of chess or kiss a beautiful stranger. We BBQ here, we surf the net, we sloth around and we dry our wetsuits. From this balcony, you can check the surf at three of Morocco’s best breaks, from this balcony the sunset will burn so bright and beautiful your eyes will bleed, from this balcony the sounds of a Moroccan fishing village will drift up and mingle with chatter from all around the world. This is THE balcony. This is a guide itinerary with everything in the all inclusive package. Times are a guide only. Morocco is very chilled out, so things tend to happen when they happen and no one worries too much what time of day it is. 3pm – Excursion time! We head over to Paradise Valley, the Souk or the Hammam, unless we want to chill out at the Surf Palace. Playing cards on the terrace. Whilst you can see Morocco from the cities of Southern Spain, once you’re on the ground you’ll realize that you couldn’t be further away… in a wonderful way! This is North Africa baby! This is a place of camels and forts and snake charmers. Where date palms grow out of sandy deserts, and kids run up to your car snotty-faced asking for sweet, sweet candy. 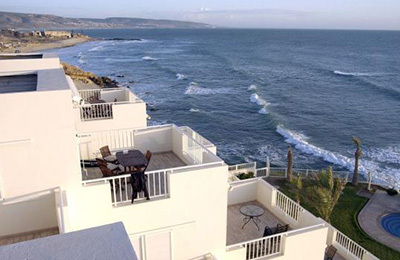 Our surf palace is located in the south of Morocco, in the village of Taghazout, near the resort city of Agadir. An area so lovely the King of Morocco has his beach palace down there. Here the High Atlas Mountains complete their run down to the North Atlantic Ocean, where goats reside in trees and where fishermen make their nightly drift out to the horizon on seaworthy car tire inner tubes. 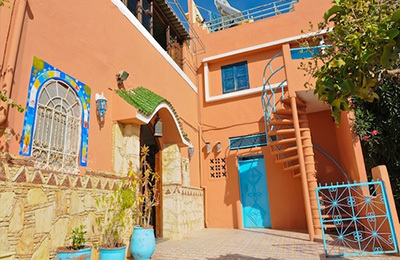 Taghazout is a stereotypical North African fishing village, with a series of narrow lanes winding either side of the one road, Highway 1, which runs through it’s middle and provides the village’s central focal point. Along this road there are a handful of shops, a marketplace and mosque and a few hotels. You can walk through Taghazout along Highway 1 from end to end in about 5 minutes, which is taking into account stopping to pat cats and high five locals. The Surf Palace is located just off Highway 1. Located near the water’s edge, the palace is populated with sun worshipers and surf rats from every corner of the globe, and they can be found lounging on our balcony watching the sea and checking out the waves. There is a combination of shared and private accommodation, though most nights you’ll pass out on the balcony with the ever-clear North African night sky twinkling away above you. We offer picks up for a surcharge from Agadir bus station and airport, however please ensure you give us a minimum of 24 hours notice in order to arrange this. This is really the only practical way to get here. Because it’s on another continent fool! (Unless you live in Africa, thereby making us the fool). Anyway, to get here grab a flight to either Agadir, which is the airport nearest the surf palace, or to Marrakesh, which is also close-ish and usually cheaper, and with more frequent flights. The airlines we usually fly with are Ryanair, Easyjet and Royal Air Maroc. Like with most of these trips the earlier you book the cheaper it will be. So book now! If you are flying to Agadir we can fetch you from the airport. Just be sure to send us your flight details. If you land in Marrakesh you can either prearrange a taxi to take you to the Surf Palace, or make your own way here on the public bus (see details below). In any case we’ll go through all of this with you personally when you book. CTM and Supratours run frequent buses from Marrakech to Agadir. The trip takes about three and a half hours and costs a measly €10. When you land grab a cab and head to the terminal (they leave from different terminals, choose one and tell your cab driver). There’s no need to book a ticket in advance, and even if you needed to you couldn’t. This is North Africa dudes. Once in Agadir take a taxi to Taghazout, the surfing village. It’s really small, so just get dropped bang in the centre of the main road. Delicious traditional dinner. BBQ every Saturday night. Agadir night city tour and clubbing party. Surfcamps, Surf Resorts, charters, hotels and other accommodation for surfers!